Football kicking equipment consists of everything a kicker can use to assist in both practice and game time performance. Aside from a football and the proper shoe, most of the items that kickers use to help with practice are indeed, very specific to that position. Though this equipment was limited in the past, our membership site reviews over fifteen items that we’ve used through the years and recommend keeping in a training kicking bag! However, every one of the field goal kicking camps I’ve ever attended instructed students to bring JUST a few basic pieces of football kicking equipment. Even then, it really depends on what a kicker is practicing that particular day as to what needs to be in hand at the field. 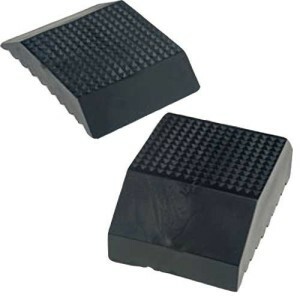 For field goal kicking days at practice in-season, a high school kicker will need the kicking block in hand in most cases if he’s not kicking off. For most kickers though, a kicking bag of some sort is a common thing to keep all this together regardless. However, these days, some kids actually prefer to kick off the ground in high school, even though they still have the obvious choice to use a kicking block. When I used to coach at these mega camps with 120+ kids on one field at Furman University I would just cringe at some of the basic football kicking equipment I saw. Kids would show up with horribly deformed footballs (the ones that had been baked in the sun with ‘tumors’ forming on the end), or shoes that didn’t fit, making for a long week for that kicker. One year a student showed up wearing ‘wrestling shoes’ to kick footballs! Not to say that he couldn’t kick in those particular shoes, but he could’ve added so much to his kicks by using the proper soccer shoes made specifically for kicking footballs. Put these two together in your mind’s eye now, a kid trying to kick a ‘distorted’, beat up football in a pair of wrestling shoes and you might imagine the obvious disadvantage during his camp experience. Well, we are going to take a look at some football kicking equipment that you might reconsider as VITAL when you are headed to a summer kicking camp, local clinic or private lessons. If you are going to spend hundreds of dollars to spend a day or more with college/professional level instruction, don’t waste the time with poor gear! Football kicking equipment is simply vital. As I’ve already said, your football kicking equipment IS extremely important because in a way, it can affect your kicking in ways that make you feel and think you have issues that you don’t really have with your swing. For instance, I could wear high tops and kick footballs in extremely poor shape (that should really be in the trash can) and it would be a challenge! Taken to the extreme, a professional surfer could not ‘perform optimally’ on a piece of Styrofoam board quite as effectively as he could on his professional board could he? That’s why we stress that the tools that we use in our ‘craft’ (whatever our craft might be) are top priority. For kickers, our football kicking equipment is a primary focus. Before we even work with a student on the football field for the first time, we bring up the topic of cleats for instance. It’s extremely important that our students understand that football shoes (football cleats) are an extension of our leg really. Think of it in golf terms, we have ONE club we are using for every stroke on the course so we want to make sure it gives us the best feel possible to produce our optimal results! A kicking cleat should be tight fitting and clean (devoid of flaps and such in the contact spot), almost like a ballerina’s shoe (not a manly comparison I know, but trust me on this one). Your shoe should not be uncomfortable, but it should be ‘light and tight’ as we like to say, giving you the ability to swing freely through the grass and yet ‘feel’ the ball on your foot at contact. Many soccer shoes serve the purpose though I know there are a few models of kicking shoe made ‘just for kicking’. I never used or found the need to pay for these specialty types of shoes. 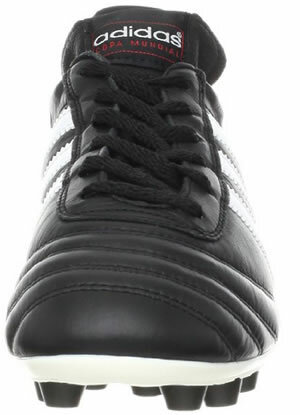 Today I have a pair of Adidas Copa Soccer Cleats and though I had to cut the huge tongue off these guys, they are very light, comfortable, high quality kicking shoes that will last a long time. Aside from cleats, another important piece of football kicking equipment is the football. Uh, what else would we kick? The kicking footballs you are using for practice sessions should not only be in good shape (not beat beyond recognition or riddled with ‘tumors’ or ‘bumps’), but they should be the correct size! Yes, depending on your age, the footballs you kick should match the footballs being used for your age group or football team. If you are unsure about what size football to kick with, check out our football sizes chart page which should help point you in the right direction. As far as kick off tees go, there are a few options and we review several in our videos for our FGK Members. For now, let’s just say that the black (Ground Zero) 1 & 2 inch tees are by far the most popular. The height you choose is strictly preference. You can choose 1 or 2 inch on the page itself. 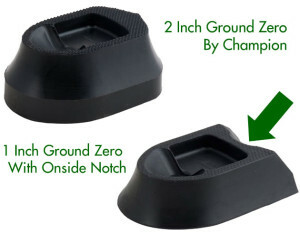 This model by Champion does NOT contain the notch in the 1 inch version (not a factor for the 2 inch) so if you are going for the 1 inch version, keep reading! Ground Zero makes a slightly different style with the notch. This can be an advantage for this version of the 1 inch Ground Zero (bottom tee in picture to the right) IF you feel the need to have a tee that can handle easy setup for onside kicks. Once you make it to the college level, there is no need for a kicking block. Field goal kickers simply kick the ball directly off the ground as you may have noticed on TV. However, in high school and earlier, kickers have the advantage of placing the ball on a kicking block. This helps the height of the kick and kickers can use either a 2 inch (maximum) or a 1 inch if they are more comfortable (though they lose a bit of that great height advantage!) with the ball closer to the ground. 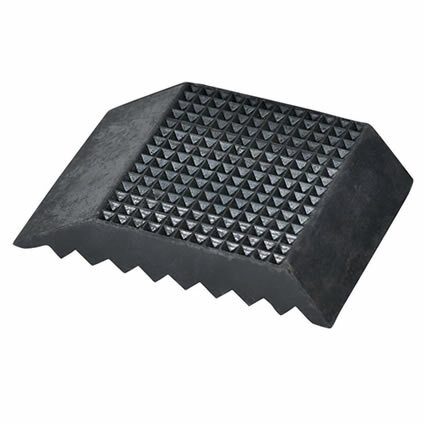 Just as with 2 inch kick off tees, a 2 inch kicking block serves most kickers in middle school and high school these days. 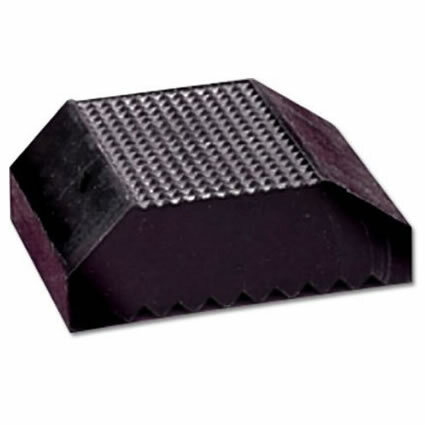 Many more older high school kickers begin the transition to college by using a 1 inch kicking block because it puts the ball even closer to the ground. When field goal kickers kick a field goal, they do so with the assistance of a holder. In a game, this is another player obviously. 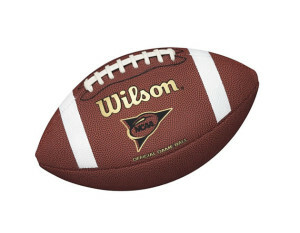 However, when we are practicing by ourselves, we need an artificial football holder to hold the ball for us. These are contraptions that can be made or purchased online. They come in a wide variety of shapes, colors and designs but all generally do the same thing. The problem with most of the popular metal holders is that they wear down over time. The arm falls off, the hinges become loose, the rubber tips where down and fall off. We’ve seen two of the red/white kicking stick designs fall apart at lessons and clinics just this year. One parent hired a welder to fix his son’s holder. Not to mention, these metal holder designs can run upwards of $40 or more. We decided to take our own design, solve all of these problems and create a holder that is light and durable. Better yet, it actually holds the ball better than the more expensive varieties and doesn’t have moving parts to break over time. It’s called the COLOSSUS field goal kicking holder because though lightweight, it is large and stable! Bonus? It’s only around $20-25 depending on the model. The yellow version has become the new standard and is quickly becoming more popular by the week. 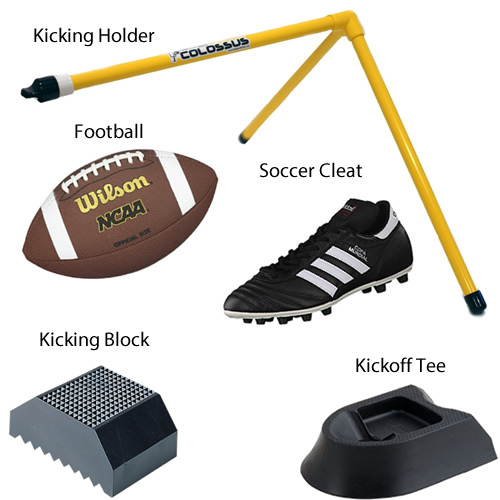 Check out the bright yellow, COLOSSUS Kicking Holder if you’d like to cross this piece of equipment off your list for a long time! If you’d like more information about football kicking equipment in general, please visit our online store. Aside from these three basic pieces of equipment, we review about 17 equipment items from cleats, holders and braces, to pumps and bags for our FGK members with video demonstrations so I would highly recommend joining FGK today! Best of luck and happy kicking! Scott Sisson was the kicker for the 1990 Georgia Tech national championship team. He was drafted into the NFL in 1992 and finished his professional career with the Minnesota Vikings in 1996. Today Scott is a Lou Groza voting panelist for the annual Placekicking Award which selects the nation’s top field goal kicker each year.